I have been doing theme development on a few Shopify stores recently, and I have come up with a workflow that has been working well. You can watch a screencast of the workflow or keep on reading. If you’re interested in more software development screencasts, I started a new channel. The easiest way to make changes to a Shopify theme is to make changes directly in the Shopify admin. The theme editor is competent, but I prefer working in my editor of choice (vim). The theme editor has no split views, which can make it difficult to reference code in other files. There is also no theme customization for the web editor. The comfort of a text editor you enjoy using is quite nice. I value being able to track the changes to a codebase over time, so it is important to be able to manage the theme’s history with Git. It is nice to be able to work with branches for experiments, use git bisect to identify when bugs were introduced, and revert changes as needed. For non-trivial theme changes, it is not a great idea to make the changes on the live site. I wanted a workflow to be able to easily support pushing the theme changes up to a a test store for review before making those changes live. This also allows more traditional releases to the live site to be created. The workflow, simplified, is: manage the theme source locally by making changes and committing those changes with Git while running a command line tool to watch for changes and update the theme on the Shopify store. It is worth noting that this workflow makes use of the command line. It is not anything too intensive, but being comfortable with common commands will help. The first step is to install and setup Theme Kit. Theme Kit is a cross-platform command line tool for Shopify theme development. It is written in Go, which means it has no external dependencies, like Ruby Shopify command line too, and is fast. Follow the install and setup instructions to get started. Once it is all setup, the theme command will be available in the terminal. As of writing this, the Theme Kit version is v0.4.2. Next, create a directory to work with the theme: mkdir STORE-NAME-HERE. This folder will be the location of the theme source code and the working directory for the rest of the workflow. After the theme is created, change into the directory: cd STORE-NAME-HERE. The configuration is used by Theme Kit to manage the different store environment settings. An example file is used because it does not contain secrets and can be checked into Git. Soon the config file with the actual values will be setup. The theme_id is set to "live" so that it makes changes to whatever theme is currently live on the store. It can be changed to the id of a specific theme on the store if needed. This will prevent secrets from the soon-to-be-created config.yml from being checked in, as well as ignore config/settings_data.json which is store-specific and does not need to be tracked by Git. Now it is time to setup the actual configuration. Copy the config example to the file Theme Kit will use: cp config-example.yml config.yml. Create a private app in your Shopify store, which will yield a password to add to config.yml. I usually call the app “Theme Development - Brett” so others know what the private app is for and who is using it. Go ahead and set the store URL and password in config.yml. The Theme Kit config is all set for development. Next up is to pull down the theme from Shopify, which can be done with the theme download command. With the theme downloaded and the Git repository initialized, now is a great time to create the first commit. Go ahead and add all the files with git add --all and make a commit with git commit. All that is left if to tell Theme Kit to watch for changes with the theme watch command. Now change can be made to the theme and they will automatically be pushed up to the store. Develop away and make Git commits along the way. The SHARED section of the config is the common values for both environments. The specific environment config values extend SHARED and overwrite the values as needed. This makes it easier to update and manage the common settings. Each environment requires its own Shopify store, and each store will need a private app (which yields the password for the config). In this config, development is the test store to be used while making changes. Once the changes are complete, they will then be pushed up to the production store. The theme commands can now be used with the env flag, which specifies the store to use. To watch for changes when developing, use theme watch --env development. Once the changes are all set, the theme upload --env production command will upload all of the theme to the live store. With multiple environments, you could setup continuous delivery (CD) to automatically upload theme changes to production when a new Git tag is pushed to GitHub or on other triggers. There are a couple of scenarios to watch out with this workflow. If someone makes direct changes to the theme in the Shopify admin, they will not be part of the Git repo and could get wiped out with any changes pushed up by Theme Kit. As long as no one is making changes directly in the Shopify web theme editor, it should be fine. If someone does and you know about it, those changes can be pulled with theme download and then checked into the Git repository. Occasionally I will start making changes to the theme before starting theme watch. Those changes can be uploaded by saving the files again while theme watch is running or by using the theme upload command with the names of the files. 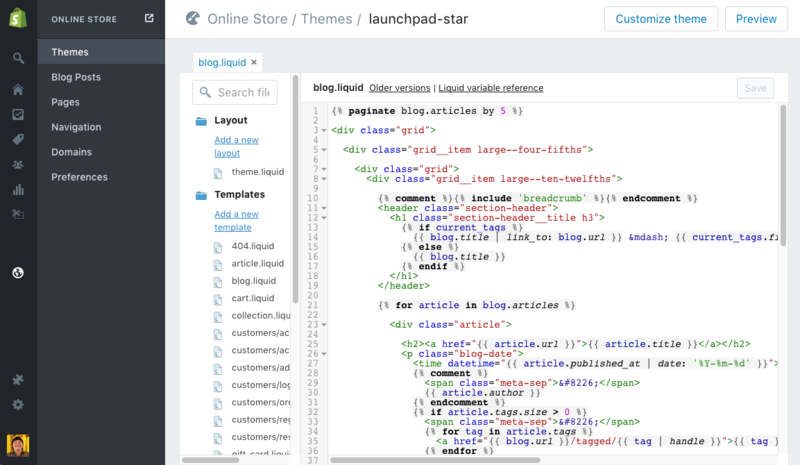 Thoughtbot’s Shopify Theme Development post was a good reference when I was exploring different approaches to theme development. The Shopify docs on theme customization are pretty useful for getting started. This workflow has been working well for me so far. If you have any questions, issues, or feedback on this workflow reach out to me on Twitter. Looking for Shopify theme development help? Reach out and let me know how I can help.